Prior to the project, investigators had observed that the orphans had a high frequency of serious developmental problems, from diminished IQs to extreme difficulty forming emotional attachments. Meanwhile, imaging and other tests revealed that some of the orphans had reduced activity in their brains. The Bucharest project confirmed that these findings were more than random observations. It also uncovered a striking pattern: Orphans who went to foster homes before their second birthdays often recovered some of their abilities. Those who went to foster homes after that point rarely did. Did you catch all that? The children receiving less human interaction, and thus less intellectual stimulation, not only had psychological developmental issues, but also experienced physical changes to their anatomy! Apparently the amount of stimulus a child receives before they’re two can cause developmental losses that can’t be undone, no matter how much one spends on primary education. 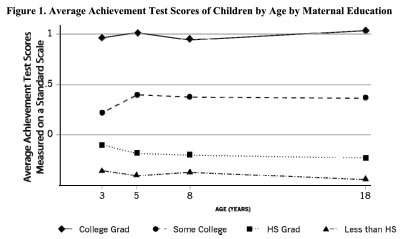 Kevin Drum rightly comments on the need to spend more money on early childhood development and posts the figure to the right, which shows the impact of the mother’s education on the subsequent achievement of their child. Couple things I take away from this chart. 1) No matter how fair your economic system, we’ll always have a fair amount of economic immobility. 2) By age 3 (!) 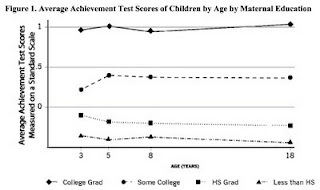 children already show substantial differences in their cognitive ability. Sadly, it appears that a lot of the K-12 money is being misspent. For the full story, do take a look at the original New Republic piece here and the subsequent The Mother Jones piece here.